*Disclosure: I was compensated for this feature. All opinions and statements remain 100% of my own. Nothing better than a good road trip with some good food! Ready for a summer road trip? I know I am! 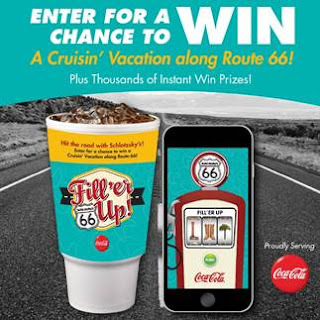 Thanks to Schlotzsky’s new Route 66 promotion, you can now enter for a chance to win a FREE four day/three night getaway vacation for four people to one of four historic cities along Route 66, including Chicago, Albuquerque, Santa Fe or Los Angeles. To enter for a chance to win, all you have to do is eat at Schlotzsky’s and play the new Route 66 inspired Filler ‘er Up game on the Schlotzsky’s Lotz4Me loyalty app. For a limited time, the game is available by entering a special 5-digit code, found on the 32 oz promotional cup, into the Lotz4Me app. In addition to the grand prize vacation sweepstakes, guests can also win thousands of other food and drink prizes when they play the instant win game or share their favorite road trip destinations, summer music and vacation photos on Schlotzsky’s social media sites. While at Schlotzsky’s, you can also check out their new Route 66 summer menu, which features three signature sandwiches and oven-baked wraps all inspired by pit stops along Route 66. Sliced pastrami and melted Swiss cheese with Dijon mustard and signature dressing served on oven-baked Dark Rye bun, or as an oven-baked wrap within a Hearty Grain Tortilla. Thinly sliced, roasted chicken breast, pepper jack cheese, bacon, guacamole, red onion, tomatoes, lettuce and fat free spicy ranch dressing served on oven-baked Jalapeño Cheese bun, or as an oven-baked wrap within a Hearty Grain Tortilla. Smoked turkey breast and bacon strips with cheddar, mozzarella, and Parmesan cheeses layered with fire-roasted vegetables, chipotle mayonnaise, shredded lettuce, tomato and our signature dressing served on our oven-baked Jalapeño Cheese bun, or as an oven-baked wrap within a Hearty Grain Tortilla.